It’s always great to hear that we’ve made people happy. We play to all types of people at all types of events – from small private parties through to wedding receptions and larger business events. Zoe hired us to perform at her birthday party at Sutton Coldfield after having seen us perform at a wedding reception last year. From what we recall, the wedding reception was quite large – around 300 people, all of whom seemed to be on the dance floor at the same time! So when Zoe told us that a maximum of 70 people were going to help her celebrate her birthday, she may have assumed it was going to be a relatively low-key party by comparison. Not so! Our first set featured an eclectic mix of instantly recognisable hits from the 1960s through to the modern charts, while our second set was taken from songs requested in advance by Zoe. The birthday girl texted us the following day, and as you can see, she had a great time! 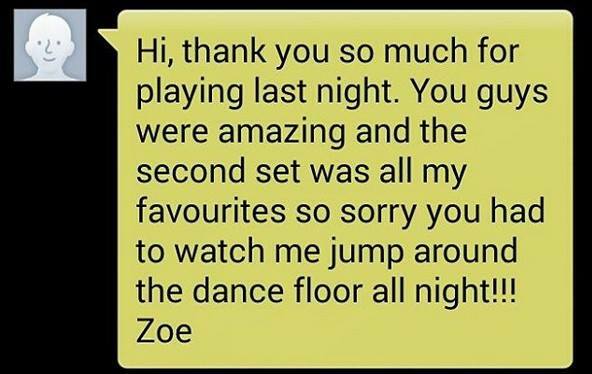 For more information on how HARD TO HANDLE BAND can brighten up your function, please get in touch: 0796 433 5657. We’d love to hear from you!